Belarus is the younger sister of Ukraine and Russia. She is described as being "a very pretty girl" by Russia, and "strong yet cute" by Lithuania. 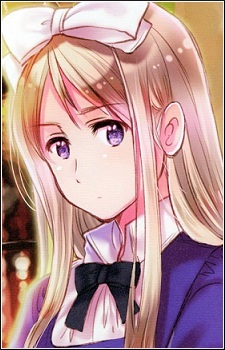 Her hair is platinum blonde and her eyes are dark blue, but in earlier artwork, her hair was colored light brown. She has a very strange infatuation with her brother, Russia, so much to the point where she wants him to marry her. Belarus often sticks by his side, seeming as though she does this to intimidate those around them, almost as if saying, "Back off. He's mine." This love is never returned, however, seeing as how Russia is deathly afraid of her and has no intentions of making her his wife. Lithuania, on the other hand, loves Belarus. This is shown on several occasions in which he asks her to go out on a date with him, and when he compliments her in front of the other characters. Belarus happens to hate Lithuania very much, a hatred that apparently goes back to when they were kids in which Belarus had been separated from Russia for some time thanks to Lithuania. Despite her appearance, Belarus is very intimidating, harsh, and somewhat insane. As stated in the English dubbed version of the anime, she may possibly be bipolar, and seems to not care that she is losing her money and her mind. She is shown several times in the anime and manga lashing out violently against other characters, such as towards Lithuania in an instance where she broke all of his fingers when out on a date with him. Apparently, her favorite thing to read is the once active Soviet newspaper, Pravda, and her favorite type of music is that of the rock genre. It has also been shown that she wields a knife as her weapon, and that she loves the occult. Also to note is that her first name, Natalia, is often rendered as "Natasha," which is a sort of nickname or informal version of Natalia. Both names have been approved and considered canon by Hidekaz Himaruya.